If you’ve ever been given glucagon, chances are you weren’t focused enough to see how it was reconstituted. Considered the counterweight hormone to insulin, glucagon is typically only given in emergency situations to quickly treat extreme lows. It’s an invaluable tool to help people with diabetes, but not a convenient one. Glucagon quickly degrades with water, so it usually is kept in powder form and must be quickly mixed with water during an emergency, says Doug Baum, CEO of Xeris Pharmaceuticals. “Glucagon is a poster child of a drug that does not do well with water,” says Baum. Because glucagon delivery is not user friendly, few people with diabetes even keep a glucagon rescue kit in the house. Even when the drug is kept in the house, it’s often up to a non-medically trained individual to administer it, and most people instead reach for the phone to dial 911. The delay can be disastrous. The steps involved in administering glucagon have made a potentially life-saving treatment about as popular as an orphan drug. But what if glucagon could instead be as easily administered as insulin and utilized by people with diabetes to treat even mild lows? Better yet, what if glucagon could even flow through your body as part of a pump system for an artificial pancreas? That’s the quest of Xeris, a company that is focusing on biologically friendly ways to make drug mixtures in liquid forms. And if Xeris’ recent media push is any indication, they may have cracked the code for how to do it. Pharmaceutical companies typically have learned to be careful to manage expectations before releasing study results, but Baum was noticeably chipper in a phone interview withInsulin Nation about the results of a recent Phase II trial of Xeris’s G-Pump glucagon infusion formula. While Baum wouldn’t give specifics on how Xeris’ glucagon formula performed, he did sound more than a little optimistic. “When we administered our glucagon, we saw the desired or intended effect occur,” Baum says. “We’re very excited that our glucagon performs very well in the study compared to Lily’s glucagon.” In other words, Xeris believes it has a created a liquid-based glucagon with a stable shelf life that does just as well as the powdered stuff found in the standard glucagon rescue kit. Xeris will officially be announcing the results of the study at the American Diabetes Association Scientific Sessions, being held June 13th – 17th, 2014 in San Francisco. What we know so far is that researchers at the Oregon Health and Science University have been analyzing a Xeris glucagon that’s administered through an OmniPod pump to see how quickly it can be absorbed into the bloodstream and bring up blood sugar levels in human study participants. 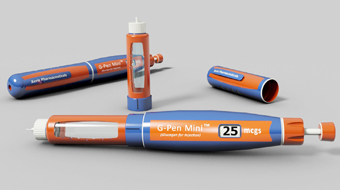 Previously, a Xeris G-Pen glucagon product did well in a similar Phase II study. While people with diabetes have grown accustomed to knowing the ins and outs of insulin, the value of an everyday glucagon might not be as readily apparent. But many researchers believe room temperature stable glucagon could be the “missing link” to make a truly closed-loop artificial pancreas system that continuously regulates blood glucose levels. Easy-to-use glucagon could also expand the use of the treatment and prevent extreme lows before they happen by allowing people with diabetes to administer it themselves. Although the Xeris formulation is being tested with an OmniPod pump, Baum says Xeris would like to make the glucagon available for any pump manufacturer who wishes to create a chamber for it. Company officials also are hoping to develop glucagon auto-injectors and pens. In short, Xeris wants glucagon to be the new insulin. “We want to be like an insulin manufacturer,” Baum says. “We want to make it ubiquitous.” Diabetes researchers will eagerly await the results of the Phase II pump trials to see if Xeris’ claims signal that glucagon can come out of the emergency room and into everyday life.